On 6th February 1958 the airliner carrying players and backroom staff of Manchester United, plus a number of journalists and supporters, crashed in a blizzard on its third attempt to take off from Munich airport. United were returning from Belgrade where they had just beaten Red Star Belgrade in the European Cup and had stopped off at Munich for re-fuelling. Twenty-three of the forty-four passengers on board the aircraft lost their lives. 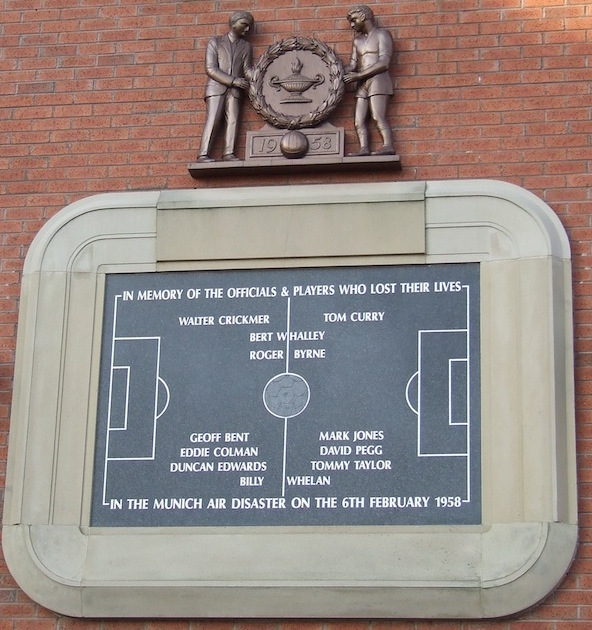 The focal point of the day is The Memorial Plaque at 3:04pm where fans gather to honour the victims. In February 2000, United fan Gez Mason commemorated the anniversary of the crash by singing The Flowers of Manchester under the memorial. He has continued to do this every year. In 2006 (and every year since), Gez has been joined by United fan Pete Martin, one half of comedy/folk duo Hanky Park. Since 2008, The Flowers has been followed by Fifty Years – a song written by Pete. The song is simply his tribute to The Babes.